For the first test don’t change any of the default parameters and immediately click the Start button. A status window pops up and gives feedback about the conversion progress. For bigger PDF documents the ETA (estimated time of arrival; in this case the remaining time) will be of help, since you’ll know if there is sufficient time for a coffee. 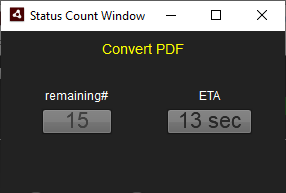 Please wait with that decision until the first 2…3 pages are converted. Then the estimated time is more reliable. FIrst, the SWF and PNG files are created; one image for every single PDF page. Once everything is converted, a new window is opened, offering the 3 file type choices and a browse button. In case of a book with mz3Viewer as a target (or still Flash; really??) you should consider the SWF format, which is the best choice for excellent text quality and full support of the search plugin.